According to Vietnam National Administration of Tourism, Sa Pa Winter Festival 2017 is set to be held on December 23 in the Sa Pa District of the northern province of Lao Cai. This is the second year such an event to be held, showcasing diverse cultural and art activities of ethnic minority groups. Coming to Sa Pa on this special occasion, international and local visitors will have an opportunity to enjoy the festival and traditional art performances, folk games, and local specialties. The highlight of the event is a fire dancing festival of the Red Dao ethnic minority group. In addition, the district of Sapa is making preparations for a street festival with parades and performances of the traditional costumes of ethnic groups, with dragon dances on main streets on December 31. 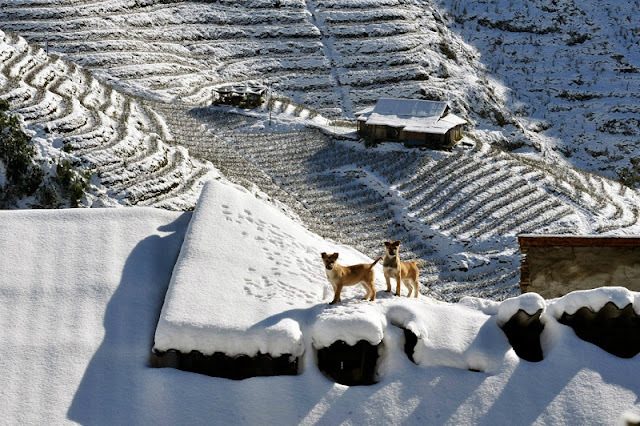 It is forecast that winter in Sapa will get extremely cold this year. Snow, ice, and sleet will likely blanket the mountainous district of Sa Pa, thus attracting a lot of tourists to the stunning landscapes reminiscent of Europe. Accordingly, To respond Visit Vietnam Year 2017 – Lao Cai – North-West Region, Lao Cai Department of Culture, Sports and Tourism was organized Sa Pa Winter Festival 2016 from December 23 to 25 at the campus of Lao Cai Tourism Information and Promotion Centre. In which, many attractive activities were hold in the framework of Sa Pa Winter Festival 2016, such as traditional music and dance performances; folk games; recreation of traditional wedding of Red Dao ethnic people; photo exhibition on Sa Pa’s snow; display of traditional ethnic costumes, local agricultural products and cuisine; especially, artificial snow space and reindeer sleigh ride model, etc. Sa Pa Winter Festival 2016 aims to create new tourism product as well as bring the opportunity for visitors to experience Sa Pa’s winter. The festival also contributes to introducing and promoting the tourism potentials and strengths, the beauty of people and culture of Sa Pa and also Lao Cai Province to numerous domestic and international visitors.